Poor Wal-Mart. They get so much “only losers hang out and SOMETIMES shop here” press. As it turns out, they are pretty easy going on their return policy. Because they are so lenient, (we know you will find this very hard to believe) someone in Bethel Park tried to take advantage of the policy. One of our Facebook followers, a trusted “retired man of the badge” was walking into the Bethel Park Wal-Mart and saw a wack-Jack pushing a buggy that contained a used car battery with stuff dripping from it. 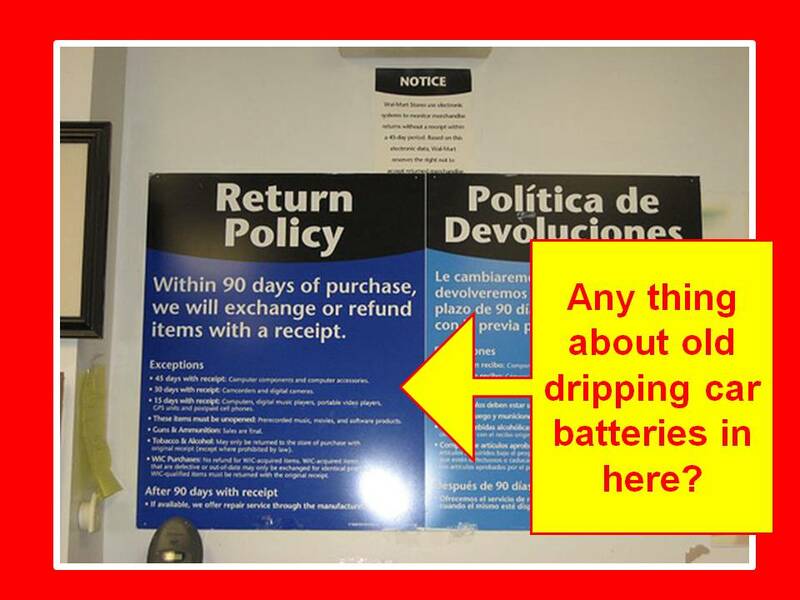 The guy pushes the buggy to the customer service counter and asks if he can return the battery!! Guy: Yeah, um, (SNORT, THROAT CLEAR LIKE HE’S BRINGING UP A LUNGER), um, I would like to return this. It don’t work no more. Wal-Mart: Well, I’m sorry sir. We have a policy that you have to have shoes on to get service here. I cannot help you. Guy: Yeah, well, ya see, I HAD shoes on when I walked in here, but the acid dripping from this battery ate my shoes away. Wal-Mart: (stretching over the counter to see) What? Sir, your battery is ruining our floor! Guy: Now you know why I wanna return it!! Look what it did to my shoes! But, take your time, I want the acid to take care of that ingrown toenail I have on my left big toe! I wonder where the Wal-Mart Greeter was when he strolled in there? In the meantime, used toothbrushes, half-cooked meat, milk that is now cottage cheese (oooo, just got a little puke in my throat on THAT one), Atari games, combs found under the floor mat of your ’67 Rambler, Commodore 64 computers, boxes of 5 1/4″ floppy drives, Kotex pads previously stuck to your head as a sweatband when you were WRASSLING with the bar buddies, low-mileage Wal-Mart Brand female intimate wear and men’s underwear that has more skid marks than Pittsburgh International Airport’s runway 2-7 are ALSO on the “Common Sense, For Those That Have None, List of Non Returnable Items” at Wal-Mart, Ya JAGOFF! Thanks to our Honorary Jagoff Catcher and FB follower Richard Schneeman for his FINE, FINE work on this! Next articleEarthquake-mageddon!!!!! Batman Spoiler Alert!!! !